Known as Queenie, the X series aircraft is shown mated to the EB-50A. 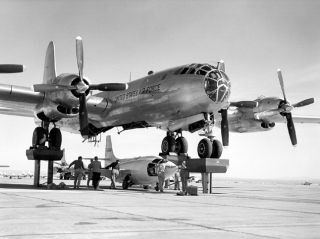 In this historical photo from the U.S. space agency, the third X-1 (46-064), known as "Queenie," is mated to the EB-50A (46- 006) at Edwards AFB, California. Following a captive flight on November 9, 1951, both aircraft were destroyed by fire during de-fueling.